If your Shorthand story is published outside your CMS (e.g. as a microsite, as most Shorthand stories are, or hosted by us) you can still launch the story from your existing website by embedding our story launcher in your CMS. When you click 'Enter' the launcher will seamlessly expand to fill the screen with the story, in the same window, without the URL of the page changing. Once they have finished reading, a 'Close' button will be available that will minimise the story and return them to the launch page. 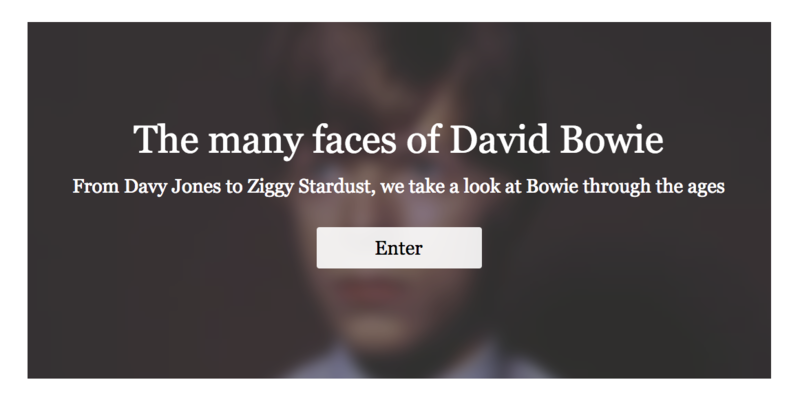 On the Telegraph website - see the story launcher for 'The many faces of David Bowie' at the end of the page. To get hold of the embed code for the launcher, click the dropdown attached to the Publish button in the editor, and then click 'Promote your story'. Enter the URL where the story has been hosted and you will then see embed code available to copy and paste into a launch page/article in your CMS. You will still need to first download the story export from Shorthand, and host the files on your server, but once you have, you can direct your readers to the launch page on your website in order to actually visit the story. NB: The security settings for both your main website (where you're embedding the story launcher) and your hosted page (where you're hosting the export files) must match for the launcher to work correctly. For example, if your main website sits at https:// then the page you're hosting the story at (via your server) must also sit at https://. If not then it will act as a standard link to the page where the story is hosted, rather than presenting it in the same window.